In March, FlexSpaces (Google Code, Alfresco Forge) was finally ported from Flex 3 to Flex 4. A first pass of moving from halo controls to spark controls was made, and it has a new look with the spark theme. In April the 04 05 2011 version of FlexSpaces added the optional capability to use Alfresco Share form xml configurations to configure view/edit mode Flex forms in a new tabbed properties dialog, thus supporting custom types, aspects, etc. See the readme-form-config.txt in the distributions for how to enable and use this configuration capability. This version also changed to have the advanced search and properties dialogs resizable using skins from flexdevtips. In May, the portlets to run FlexSpaces in portals were updated. To keep them from getting outdated as quickly, they are now wrappers that reference a separate install of the in-browser non AIR version of FlexSpaces (that can be updated separately). The older FlexSpaces Liferay portlet supported Liferay 5.x, the new one supports Liferay 6.x. This is available in the Liferay community plugins catalog. The FlexSpaces portlet and gadget for the GateIn portal were both updated. 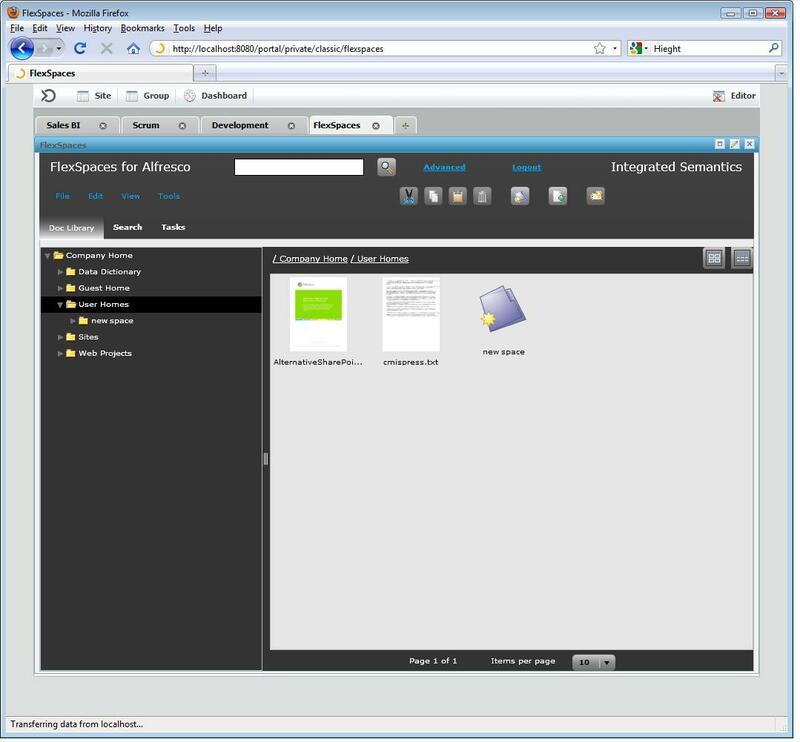 The FlexSpaces portlet for the original JBoss portal was also updated. In April, CMIS Spaces, based on FlexSpaces, was ported from Flex 3 to Flex 4. CMIS Spaces has both atompub rest binding support (default, with more features hooked up in the UI) and web services SOAP binding support (optional, with only navigation and search features can be used through the UI, although the full featured data access backend code is present). Note that the ActionScript code for all the CMIS SOAP binding APIs was re-generated with FlashBuilder 4 / Flex 4.1 SDK / fiber (and this improved things to not have repeated code for types across the multiple CMIS SOAP web services). In May, a Liferay 6.x wrapper portlet for using CMIS Spaces in a Liferay portal was introduced. This portlet references a separate install of the in-browser version of CMIS Spaces. Having these two parts allows CMIS Spaces, like Flex Spaces, to be updated separately and avoids the portlet getting out of date. The CMIS Spaces portlet is also in the Liferay catalog. I recently added both a FlexSpaces/Alfresco Gadget (Google) and a Portlet for the new GateIn (eXo+JBoss) Portal. See Alfresco Forge for downloads, Google Code for source. See previous posts on other portlets ( Liferay Portal portlet , JBoss Portal portlet). 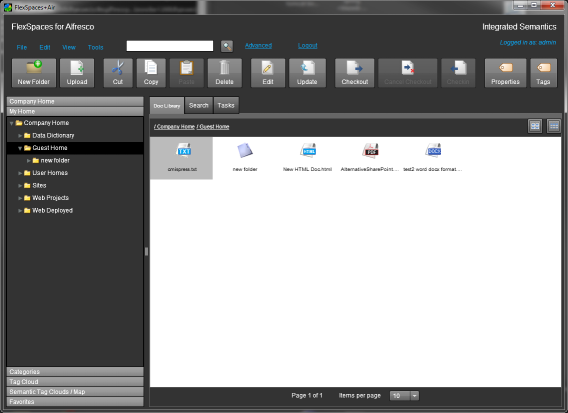 The gadget and the portlet work on both app server versions (Tomcat, JBoss AS) of the GateIn beta1. (I had to add a tld file to get the portlet to work on JBoss). The gadget can be used on dashboard layouts. The portlet can be used in other layouts. In the screenshot, the FlexSpaces gadget is maximized, so it doesn’t look like the usual gadget layout. The beta1 seemed to not allow saving an edit to change from a 3 column to a 1 or 2 column. (FlexSpaces can made to take up less space by setting the show header area preference to false, and hiding the tree with the show / tree menu). Also the beta1 didn’t display default values for the FlexSpaces gadget when the edit UI mode is used, so editng the gadget xml is easier (This is only on gadgets, regular portet preferences UI edit mode was fine). See the readmes in the flexspaces-gadget.zip file and the flexspacesGateInPortlet.zip file for setup instructions.